This tree species contains, within its members, some of the oldest living beings in the world. 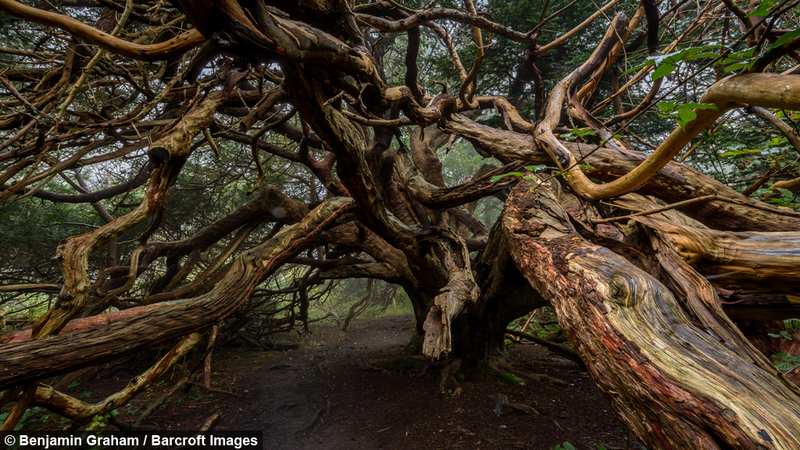 Some of the older yew trees are difficult to date and several individuals are thought to be over 2000 years old. 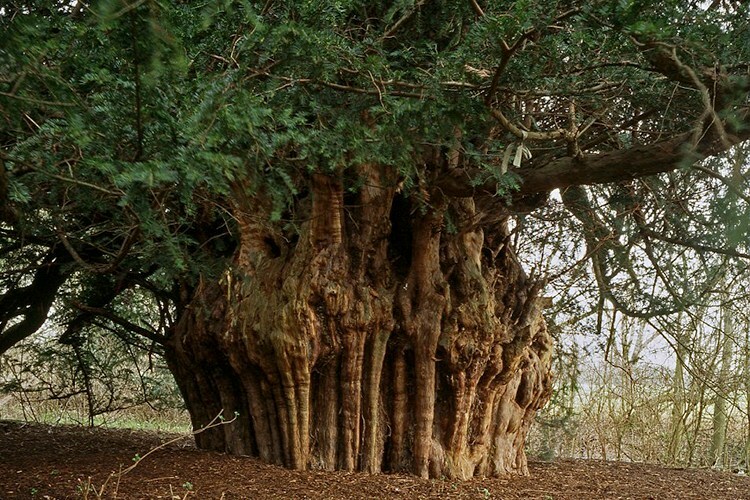 There is one particular tree, the Fortingall Yew, with it’s estimated age ranging between 3000 to 9500 years old! That puts it well within the lifetime of Jesus Christ. It is even possible this venerable tree was going strong when Lord Krishna’s lotus feet were treading the dust of this planet. Imagine that! accentuates and reflects light even in the middle of winter. The wood is extremely hard, close grained and very strong. The bark is reddish in colour and flakes off the trunk easily. In the U.K the yew is one of the first trees to flower in the early spring. The flowers themselves are very small and unremarkable, but they produce huge quantities of yellow pollen which, if the conditions are right, can form luminous clouds on sunny days. The male flowers produce the pollen and the female catkins, once pollinated, become the fruit. The bright red berries of the yew are eaten greedily by birds. All parts of these trees are poisonous, remarkably the berries are edible. Although, as children we were always advised to stay away from them as the seeds are toxic. The tangible aura of the tree made a strong impression on me in childhood. Kids from my street would make our way to and from school through the local churchyard. Two grand old yews, one male one female, sheltered the old slab path. We would run and play around the trunks, mesmerized by the twisted mass of roots nestled above the eroded soil. Yew trees were planted in pre-christian times to mark and guard sacred sites. The trees themselves were considered sacred and most likely worshipped, although this has always been contested by the academic intelligentsia. You only have to spend time with an ancient yew and cultivate a heart to heart connection to it, for it to reveal its ancient past to you. After the Christianisation of Britain, the people built their churches on and around these already sacred mounds and groves. From that time onward, the Yew tree became synonymous with life and death, graveyards and churches. Henceforth, the Yew has always been associated with death and the eternal nature of the soul. 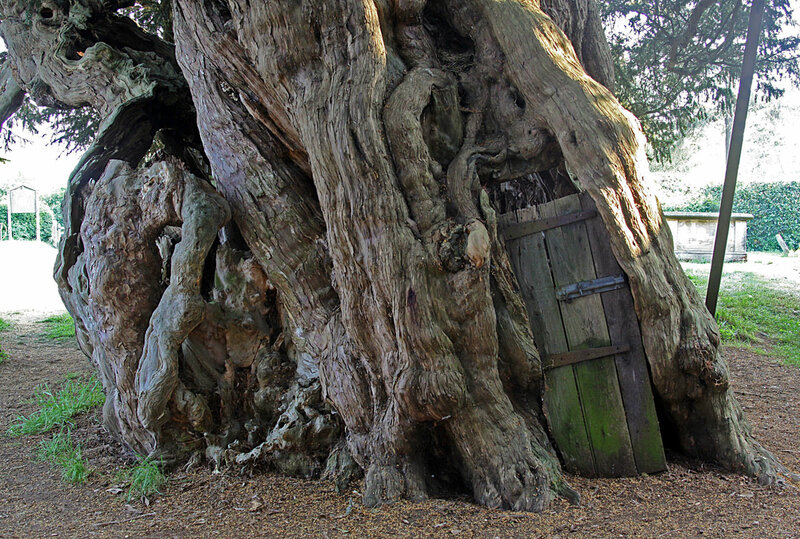 The Yew is a natural doorway into understanding these mysteries. The personality of this tree is very ancient. It talks of the oldest knowledge and remembers the vedic past. Druids, who were somewhat similar to the Brahmins of India, worshipped in groves of yew and oak. 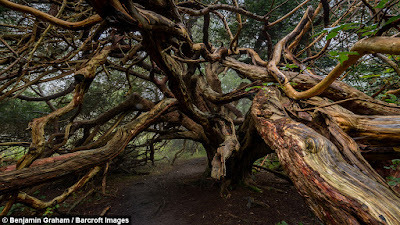 Yew is a contender for being Yggdrasil, the world tree from Nordic mythology. New research has emerged that Yew, rather than Ash, may have been the sacred world tree worshipped at the the Temple of Uppsala, a pre christian sacred place in Sweden. This tree reminds me of a Banyan tree and exhibits some similar characteristics and qualities, for example; the tree can propagate itself and can grow continuously. Its long branches, if left unmolested, will droop to the floor where they can take root and become new trees. Similarly, it sends up new shoots from its root systems, sometimes tens of meters from the original tree, which in turn also become new trees. Just like the banyan, the heartwood of older trees rots away while the living bark wood continues to grow outwards, meaning the trees often become hollow. All these factors make the tree difficult to age, but also makes it unique looking and long lived. There have even been documented cases of these trees getting so large that people have lived inside them! The fact that this tree is evergreen and looks so ancient, it makes a very strong impression on the senses. This is especially true in a temperate climate when all else is lifeless and grey in winter seasons. 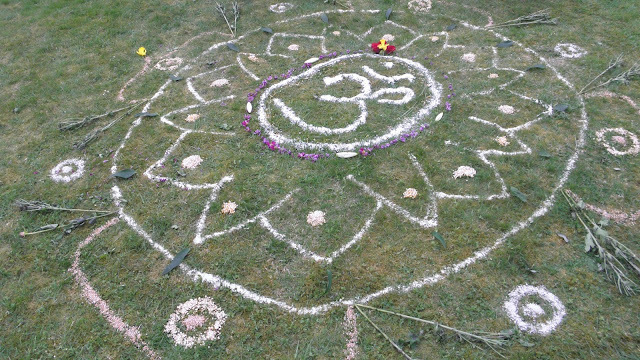 Yew is teaching the impermanence of life and the undying and eternal nature of the soul. The yew teaches that even after death life returns. Yew speaks of transmigration of the soul, exhibited by the fact that Yew can continuously grow even past its seeming death. Even the oldest of of trees send new and living shoots from its body long after the heart wood has died and rotted away. Yew speaks in an ancient language, the language of elements, the language of creation, the language of the cosmic dance. Yew invites us to step into the mystery of being, to reclaim our place as spiritual beings in relationship to the supreme reality. Yew is a doorway back. So what do these verses mean? They can help us contemplate and understand deeper spiritual topics. It is a message of going beyond our mundane material life. To see under the veneer of our lives. If we can hear Yew's message we are on the way towards that eternal realm. We just need to spend time with the tree and listen with an open heart.